I am living outside my comfort zone. I’ve followed enough motivational people and business coaches to know that this is where personal growth happens. I was in a relationship with a “good” guy, but I didn’t like how I felt while in that relationship. I wanted something more. I had a beautiful apartment, but after 10 years, I didn’t like that I had nothing to look forward to in that apartment. I wanted something different. In business, I had a good roster of clients, but I didn’t like how I wasn’t challenged to be creative. I wanted to create the next step for my business. So here I am with no mans, no apartment (well, kinda – I still have it but rented it), starting over with my business, sleeping in my high school bedroom and doing the dishes each night after dinner. I have quite literally crawled back into the womb. It’s hard to force myself to stay in this zone. When I’m contacted for an assignment that I know will momentarily resolve my discomfort of feeling lacking and penniless (I KNOW in my soul of souls that I am NOT penniless. But Amex and TD Bank don’t believe in soul messages), it’s difficult to say no. The concept of holding out for a higher rate or negotiating the time I can commit to something so that it won’t infringe upon this new business line I’m trying to create, goes completely against my desire for instant gratification. I paid my dues already, right? Let’s just take some cash to the bank so I can get back in Sephora for makeup I don’t need, grab some designer shoes with heels I can’t wear for more than 39 minutes and get some beauty services for godsakes. I have some really, really hard goals this year. So hard that I can’t quite see how I’ll accomplish them. And with that comes, as far as my eye can see, lots of people (resources) and products to pay for and not nearly enough cash flow to take care of it all. And Beyoncé relates… I made a deal with myself that if a payment of a specified amount arrived by the Monday that Beyoncé was in Dallas, I would treat myself to the concert. I made a similar promise to myself before. Back in 2013, it was for the Mr. & Mrs. Carter tour, the final performance in PARIS. I missed the deadline. At the time, I was so disappointed in myself that I failed to see that even though I missed the goal, working toward it had led me to building a new foundation that would help me build my business in a new direction. Instead, I immediately took on a high dollar assignment that consumed all my time and basically laid waste to all the work I’d done to take my business in the new direction (the work I am now having to start over). This time, I met the goal. On the day of the concert, at 5:47 PM, the payment arrived. Immediately, I thought I should use the money for something responsible. I should use the time to work on my business. Then I said, “Hell naw.” (I ain’t sorry). Keeping a promise to myself meant more to my future than anything else I could do that night. I bought last-minute tickets online (would have been impossible in New York!). 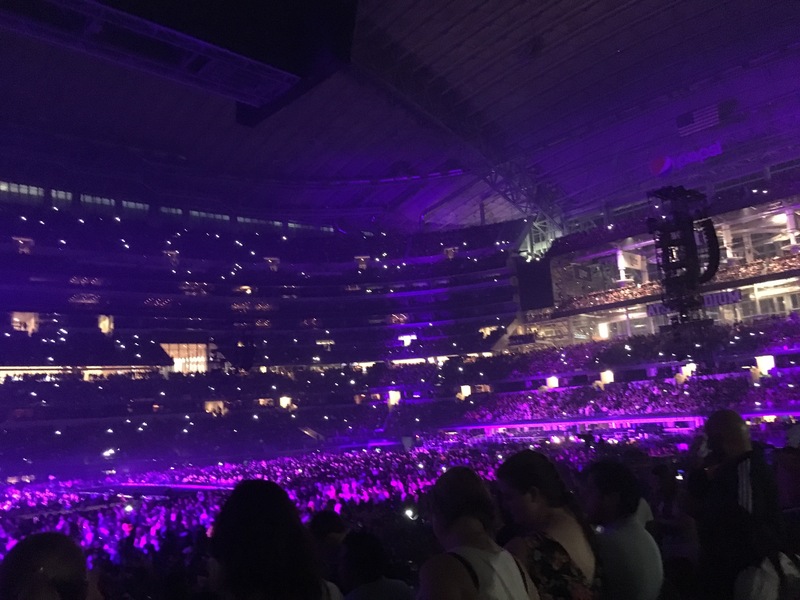 I was on the road for the 7:30 show at 7 and quickly discovered that Beyoncé didn’t come to Dallas – she came to Arlington. What was Dallas thinking when they built this stadium? All that available real estate near downtown AND public transportation and you don’t build your namesake stadium for your namesake team on your own land, in your own city, in your own county? Arlington is a waaaaaay out of the way, but I digress. I can’t stand DJ Khaled. I was borderline in my opinion of him. Then I followed him on SnapChat for three hours and finalized it as true dislike. Yet this truly annoying individual CAN indeed spin and had me yelling “I’m in love with the coco,” while hoisting my $19 frozen stadium margarita. Beyoncé was late taking the stage. Not Lauren-Hill late, and worth the wait, but still quite late. I was excited, yes…..but no. I just wasn’t my usual in-the-moment, landing-every major-verse-self. Instead, I found myself looking around and criticizing the audience, rationalizing that I wasn’t having a good time because the crowd was so lame. They were SITTING at a Beyoncé concert! No one was dancing except for that one girl in front whose moves consisted of throwing her hands above her head and awkwardly jerking them around. The lady in front of me kept taking video like she was being paid to capture footage from a Jumbotron. Taken DURING “Drunk in Love.” “Drunk in love!!!! !” Sitting or standing and looking. Made it a kinda lonely sing-along. My sister and I have had more fun singing this in the car! Finally during an interlude (I’m not a fan of ballads), I go to the bathroom and while in the hallway, I have a mental heart-to-heart with the mean girl inside me. Real Tina: This is a dream, what’s your problem! Why aren’t you enjoying it more! Mean Girl Inside Tina: You should feel guilty cuz you ‘spose to at be home working! You have no business spending all this money. $45 on parking?! It’s irresponsible. Real Tina: I will be even more productive if I give myself a timeout to have fun and celebrate. Mean Girl Inside Tina: You not even cute. You been wearing that same black skirt for three months now. Real Tina: Yes I’ve been rocking this same black skirt for a while, but it’s a Norma Kamalli and you already know she’s been rocking it for over 30 years and it never goes out of style. And, beeyotch, I got on Givenchy heels. Werk. Mean Girl Inside Tina: Concerts in New York are so much better. You know how you’re in one place and you swear up and down that another place would be more fun? For example, the night Prince died, I was so sad not to be in New York. I knew that even the commute home on the L train could lead to a celebratory tribute (like it had the night MJ died). Meanwhile my brother was IN New York and commented that Brooklyn was lame and had he been in the south it would have been lit. Real Tina: No matter where you are, you have to bring the party with you. Mean Girl Inside Tina: People here are lame and don’t know how to have fun. Real Tina: You FEAR that YOU are now lame. So you are seeing it in everybody else. Ding, ding, ding ding. There it is. I’m feeling bad about myself and where I am right now and applying my judgement to everyone around me. When did I care so much about what other people are doing? Never. Like the old joke, New Yorkers are more likely to criticize your fashion than your beliefs. You do you and make life meaningful whichever way you want to. Just don’t wear capris while doing so. Me feeling so negative about Dallas and the people at the concert had NOTHING to do with them. It was all about how I felt about myself. Freshly pep-talked, I go back in. After making my way down to my row, I realize I’m in the wrong section. Trying to be cute in those heels AND stand up all night was already taking its toll on my toes. I saw an empty seat and instead of going back up and down again, I took the seat and called it my new section. I had an even better view. I was crazy in love and totally feeling myself. The real me was back. Then I noticed — the new section was LIT. There was a girl swinging around the handrail, her hair whipping faster than Bey’s. Groups of girlfriends were hanging on to every word. And one woman looked terrified because she simply wanted to sit and watch the concert but was unable to do so because of the frenzy in front of her. I sing to someone’s man, “Can’t keep your eyes off my fatty, daddy” while pointing to mine. I’m fully having my lemonade moment. So did I change my way of thinking or did the crowd change? I think my positive thinking and revived energy led to a changed crowd — and more. You see, the day after the concert, the concert ticket reseller called me and said that since they delivered my tickets late (at 7:31 pm instead of by 7:30 pm), I’d be receiving a full refund. Plus $100 to use toward a future show. This entry was posted in Travel, Work LIfe and tagged Beyonce, Dallas, entrepreneur, goals, humor, L train, lameness, Mean Girls. Bookmark the permalink. One of my favorite post of the “coordination series thus far”. Much love on the Business. While I can’t claim to be a native New Yorker, I got 15 years on me and no other place can do anything right! I went to a Zumba class here and nobody could move, much less dance (the instructor, barely). I went to the Lauren Hill concert and when they were playing soca I started whipping my scarf above my head and every eye was on me. The Bey concert took the cake. It’s like everyone is afraid of calling attention to themselves. I know that some think we are over the top, but New Yorkers know how to LIVE!! On the other hand, if everything is wrong, then I’m the one with the problem!!! I’m trying to take it all in stride til I make my way back home!